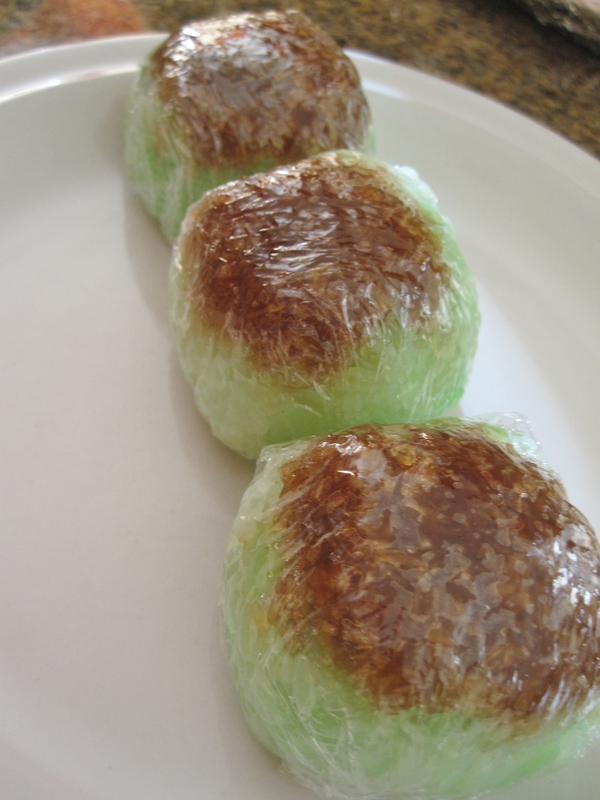 In Malaysia there are lots of “kuih” (cakes sold in small pieces) made with glutinous rice and coconut– “pulut inti” is one of them. People eat it as breakfast, tea time snack or dessert. Traditional pulut inti are glutinous rice with sweetened grated coconut on the top, then wrapped with banana leave to a pyramid shape with a square or rectangle bottom. I cheated by using cling wrap instead of banana leaves :-). Also, some pulut inti sold in Malaysia are bluish in color– this is because people sometimes use blue pea flower to dye the rice. I don’t have such flower here for the coloring, but I do have pandan extract that gives green color. The first time I made these treats, I over mixed pandan extract into the rice, so the rice came out very evenly green. So this time I just slightly mixed in pandan extract, and it turned out very beautiful with that marble look– just like a piece of jade with all kinds of green and shade. Glutinous Rice Packets with Coconut "Pulut Inti"
Prepare glutinous rice: drain the rice, then add salt, coconut milk and water. Mix well. Drizzle in green pandan extract and stir briefly. This is to create a marble look on the rice so don’t over stir it. Lay rice evenly on a deep dish steam tray, steam for 20-30 minute over high heat. Set aside. Prepare coconut topping: In a small sauce pan dissolve sugars in water, then strain to remove impurities in coconut sugar. Return sugar syrup back to the pot, add in coconut and salt. Cook on low heat until coconut is tender and fragrant, and the liquid is almost dry. Stir to prevent burning at the bottom. To assemble, line mini muffin molds with small pieces of cling wrap. Put in about 1 tsp of coconut at the bottom of muffin molds, then pack in about 2-3 tbsp of glutinous rice on top of coconut. Wrap up with cling wrap. 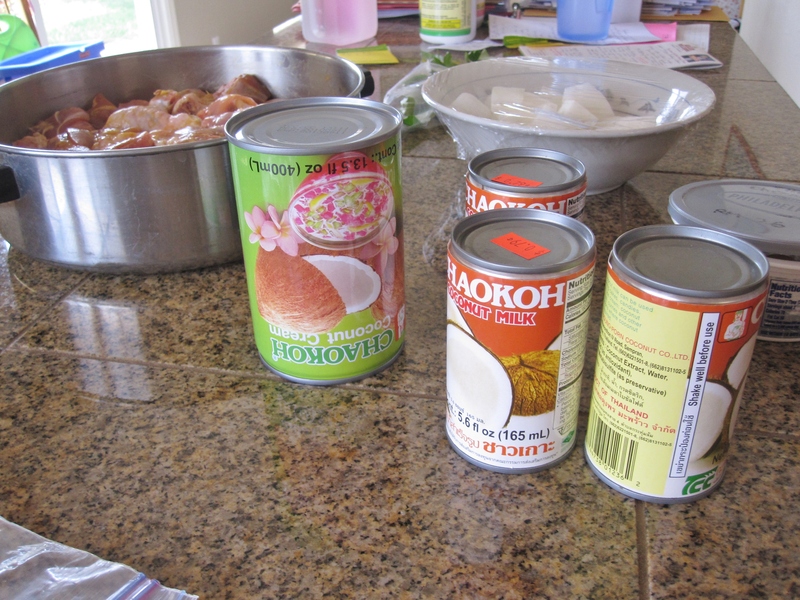 Invert the packets so the coconut is on the top of the rice. Preparing coconut topping: taste for sweetness. 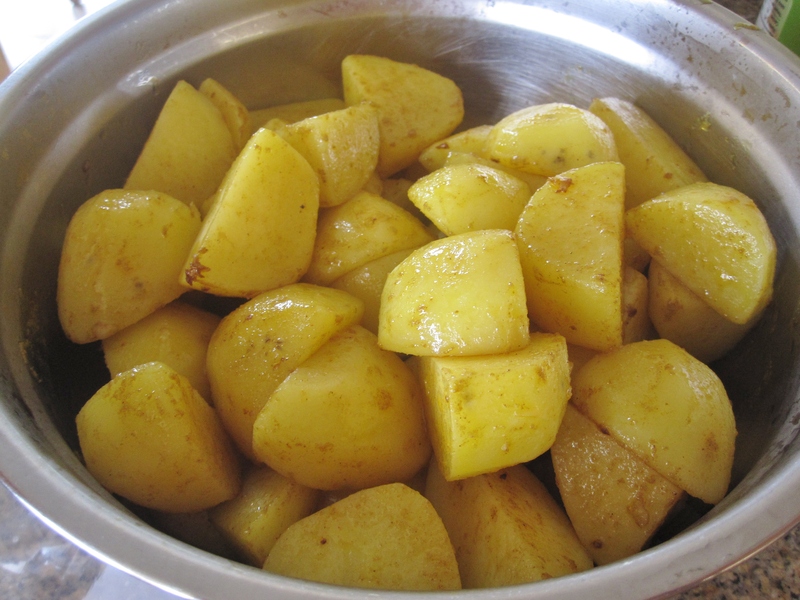 Add in some brown sugar if necessary for sweetness and darker brown color. Yes! 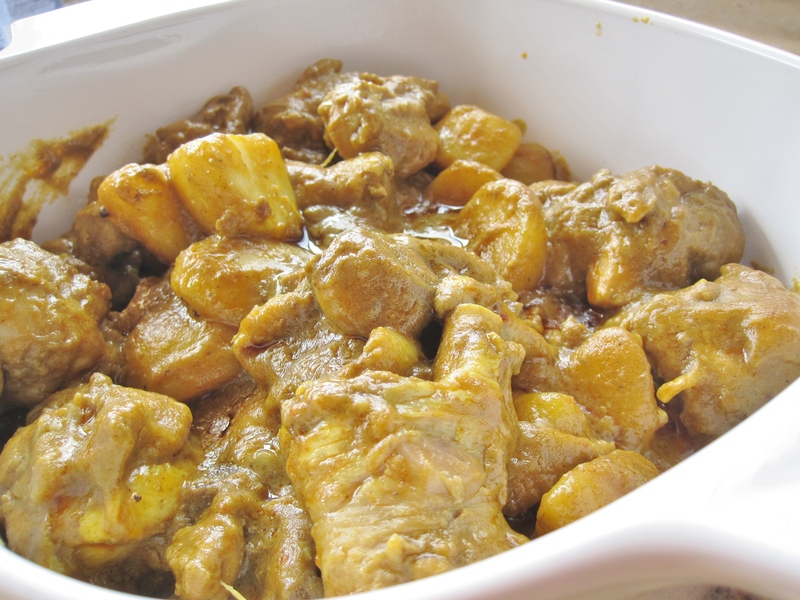 I am proud to say I have finally perfected this recipe, after the first trial and the second trial— it tastes almost the same like the ones I had growing up in Muar. 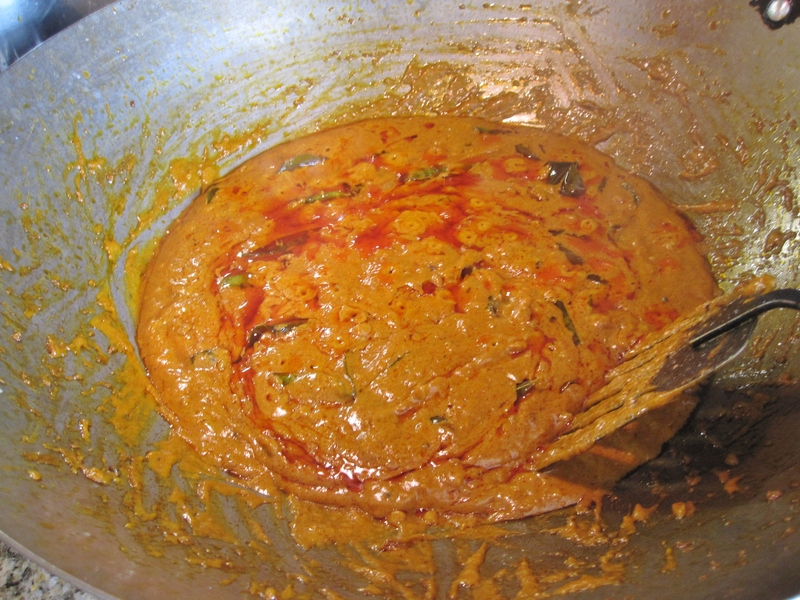 This time around the otak-otak is much softer and moisted, and has a sheen layer of chili oil. I was out time and chose to steam cook, instead of wrapped with banana leafe and pan grilled. Muar "Otak-Otak" Trial #3 麻坡乌达-- best version! Saute garlic, shallots and red peppers with little oil until aromatic. Set aside to cool. Combine all seasoning (except water) in a big bowl. Mix in sauted garlic, shallots and red peppers. Add in fish paste and blend well. Add in water, follow by coconut milk, and mix well. Pour mixture onto a greased deep dish round plate, smooth the surface. Steam for 10 minutes until otak-otak is cooked. 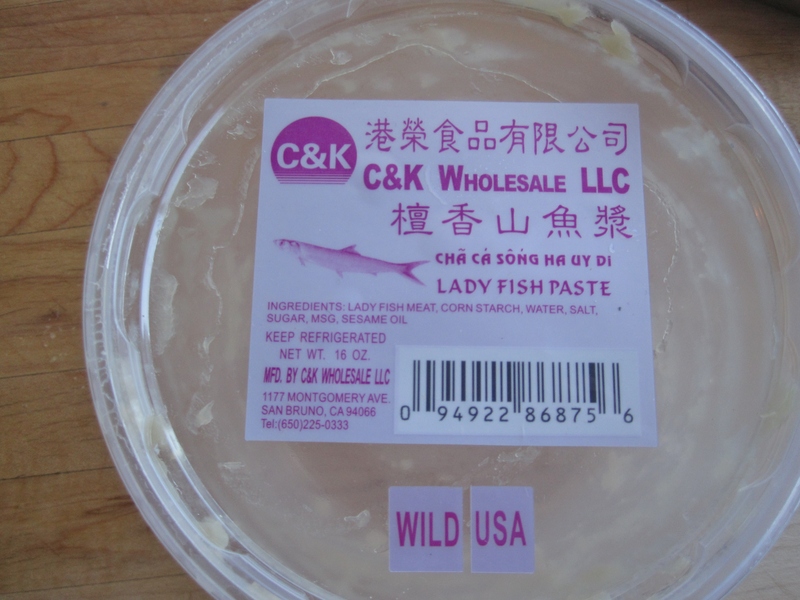 This is the brand of frozen fish paste I used for making otak-otak. Use a knife to shave corn kennels from the cob, then use the back of the knife to scrap down the cob to get pulps and juice. Set aside. Combine all dry ingredients in a bowl. Add water the whisk until smooth. Stir in corn kennels, pulps and juice. 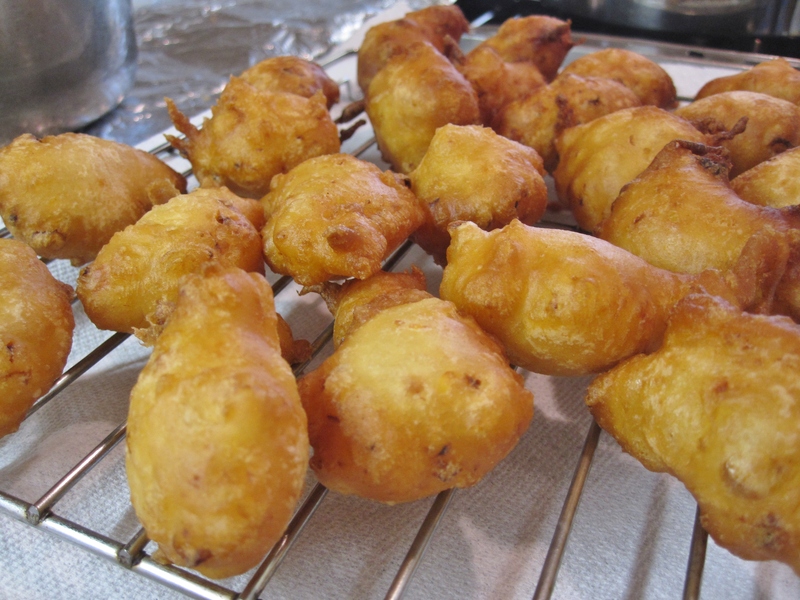 Gently drop tablespoons of batter into hot oil in several batches. 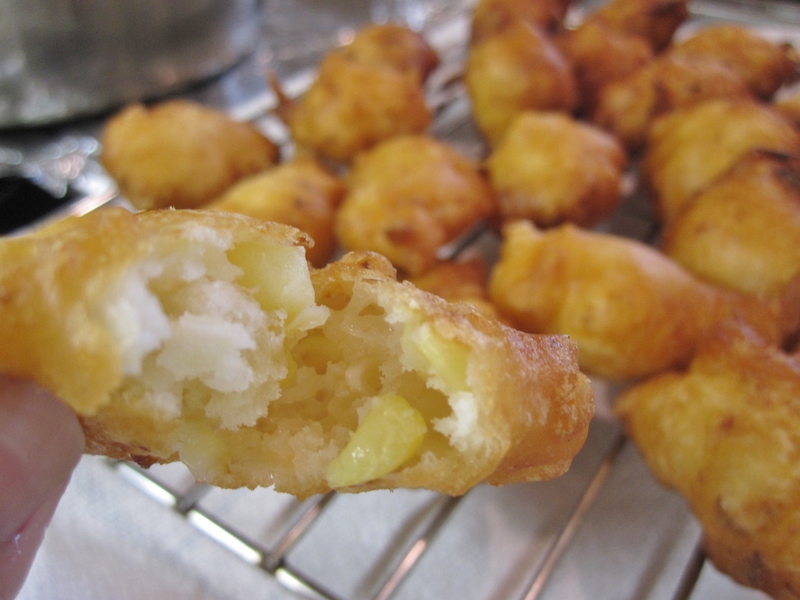 Deep fry until corn fritters are golden brown. Turn down heat to medium if fritters brown too fast. Drain on a rack or paper towel. Serve immediately. Canned corn kennels can be used if fresh corn is not available. 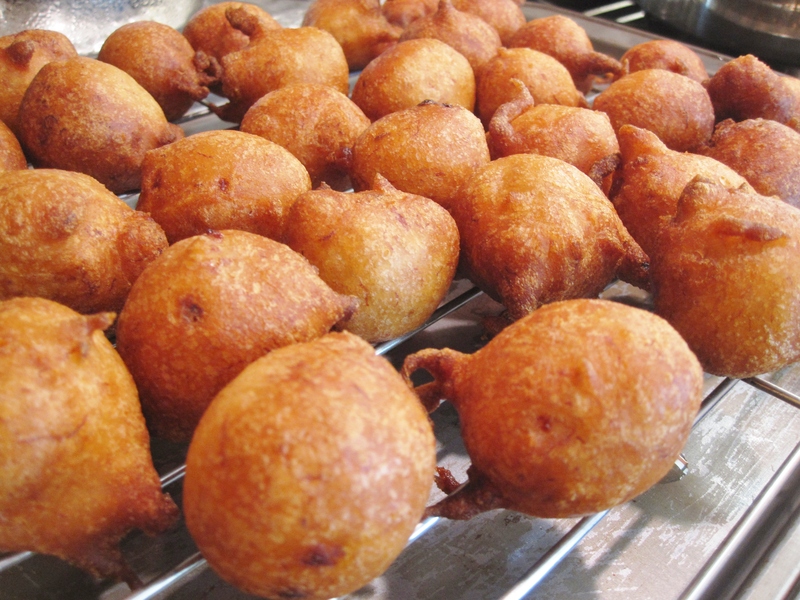 Rice flour and tapioca starch: addition of rice flour makes the fritters crispy but produces a harder dough texture, thus tapioca starch is used to make the dough softer. Back in Malaysia, my family will always buy some Chinese ham and mixed nut mooncakes 金腿伍仁月饼(we are one of those few people who likes nutty mooncakes over the typical lotus paste with salted yolk mooncakes– too sweet for us!). Being here, it’s hard to find a good flavor mixed nut mooncake. 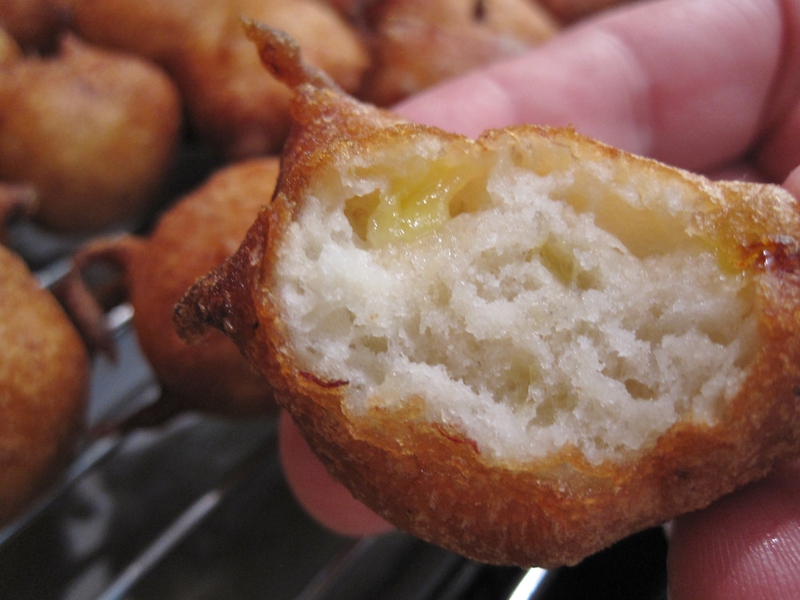 Kee Wah Bakery’s version is similar to the taste from Malaysia, but they are expensive– selling at USD10 a piece! 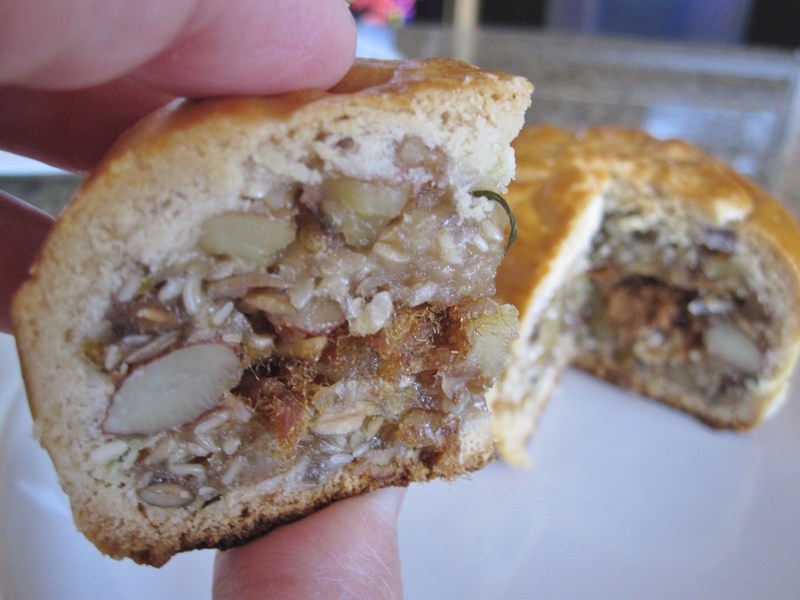 So this year I finally decided to make my own mixed nut mooncakes. To make the pastry: combine all pastry ingredients in a bowl and mix well to form a dough (the texture will be like play dough). Cover and rest for 1 hours. Then divide into 8 equal portions. While the pastry dough is resting, prepare the filling: combine the seasoning and filling ingredients and mix well (you can use a stand mixer or hand mix). 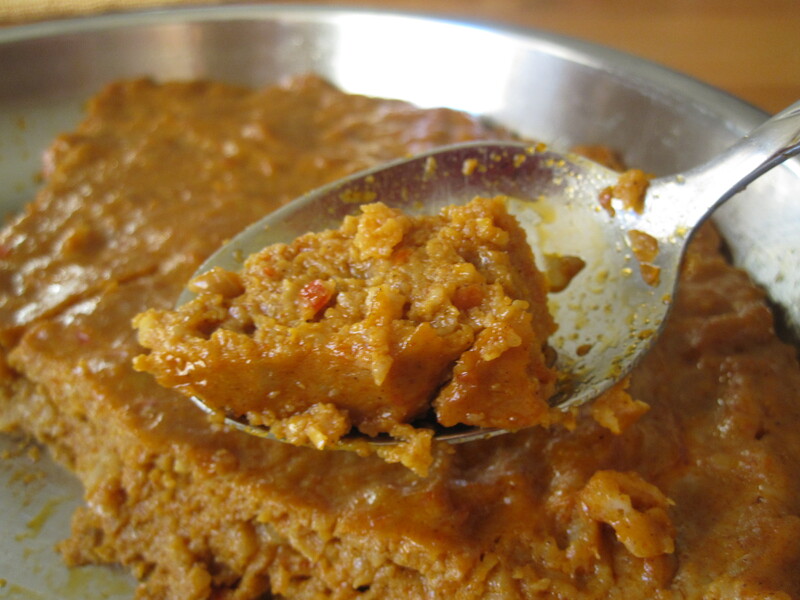 Divide the filling into 8 portions. 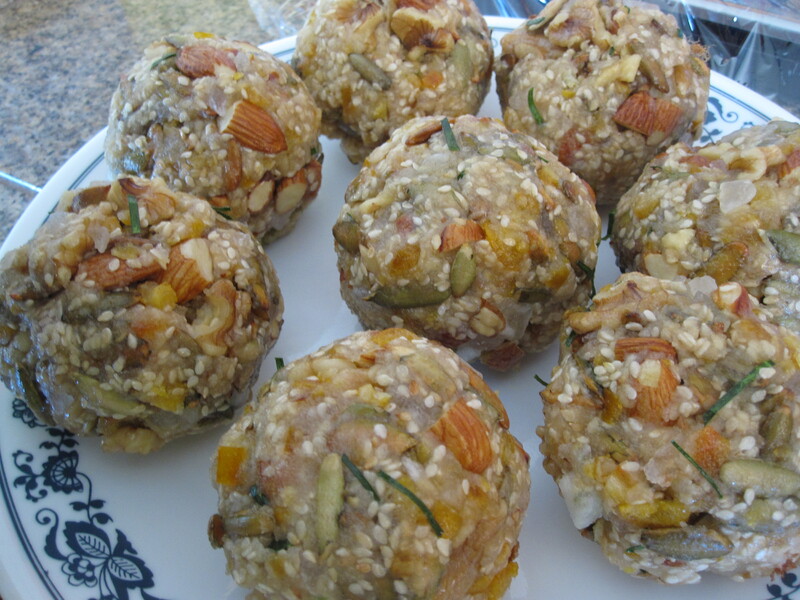 Use both hands, loosely form each portion into a ball. Scoop in one tsp of pork floss in the center of the filling, then tightly pack into a ball again. Carefully wrap a piece of pastry dough around one ball of the fillings. You might want to roll out the pastry dough to a thin layer before wrapping. 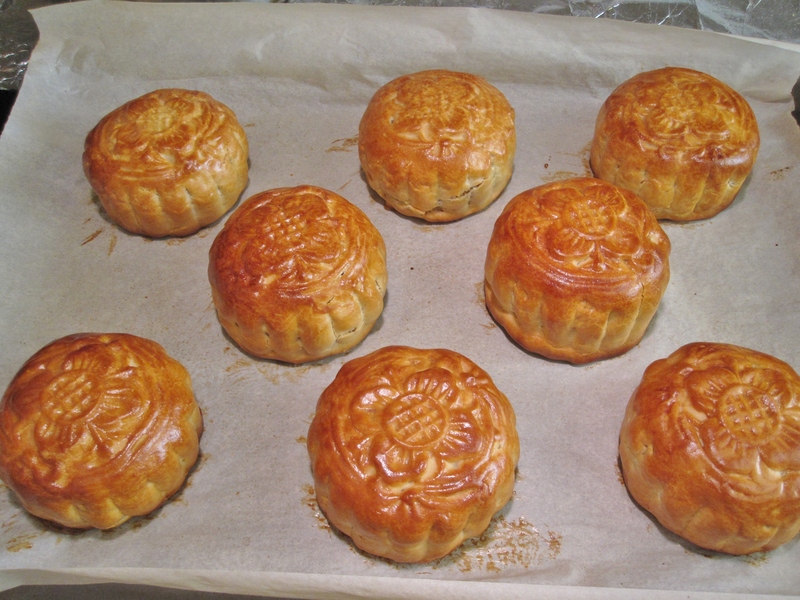 (I find this step is the most challenging because only little amount of pastry used for each mooncake in order to achieve a very thin layer of pastry. As you can see my pastry was quite thick– probably because I only flattened the pastry with my palm and didn’t roll it out to a very thin layer). 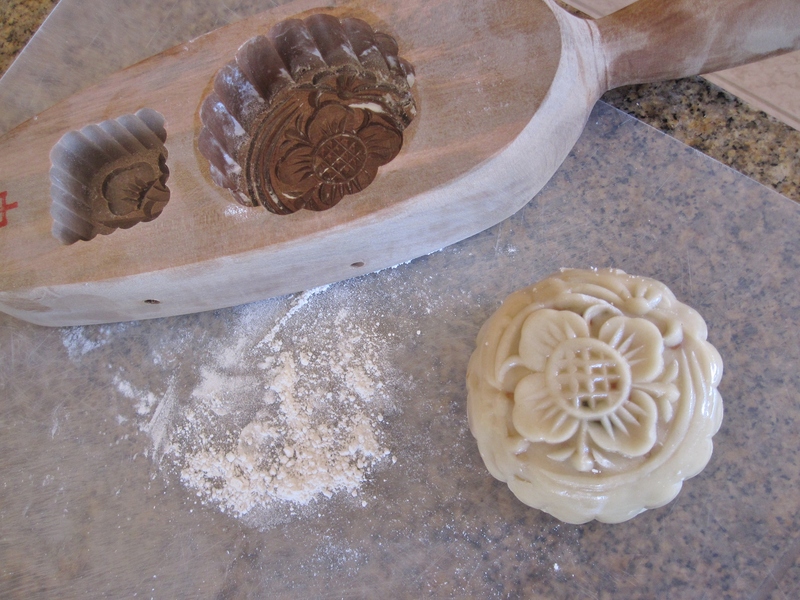 Dust wooden mooncake mold generously with some flour, then carefully put in mooncake and press against the mold. 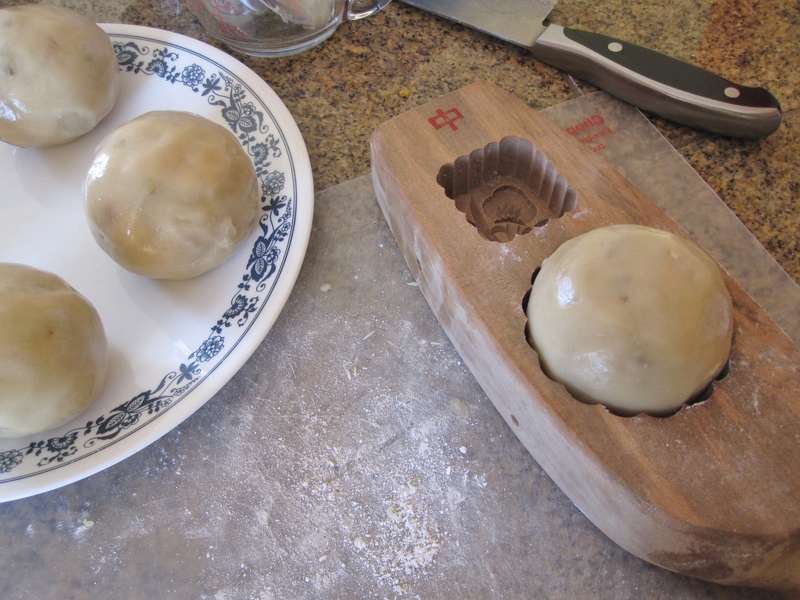 Tap the wooden mold on a hard surface to invert the mooncake. Repeat step (3) and (4) for the remaining pastry dough and fillings. Preheat oven to 375°F. Before popping the mooncakes into the oven, spray some water on the mooncakes (this is to remove the flour dusted on the surface so when mooncakes are baked they won’t have a powdery look). 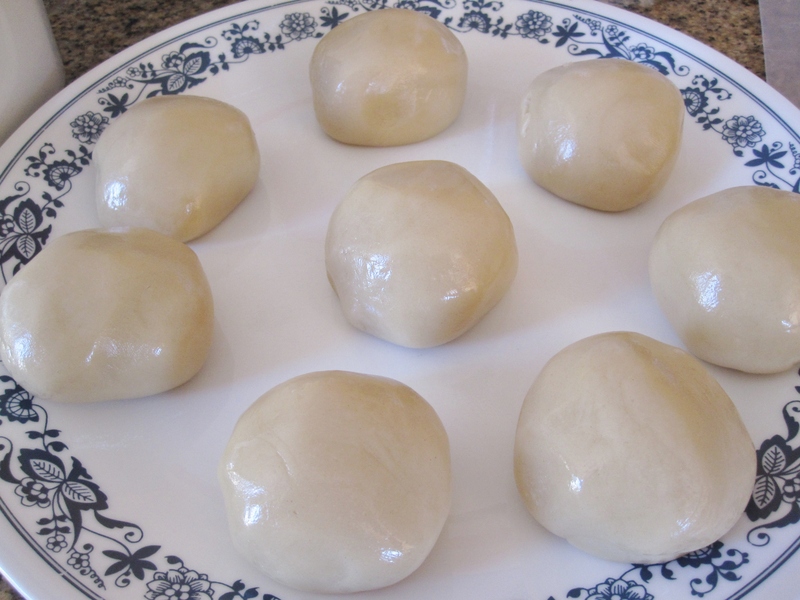 Bake for 25 minutes, remove and apply egg wash, then bake for another 5 minutes until the mooncakes are browned nicely. Remove and cool on the rack completely. 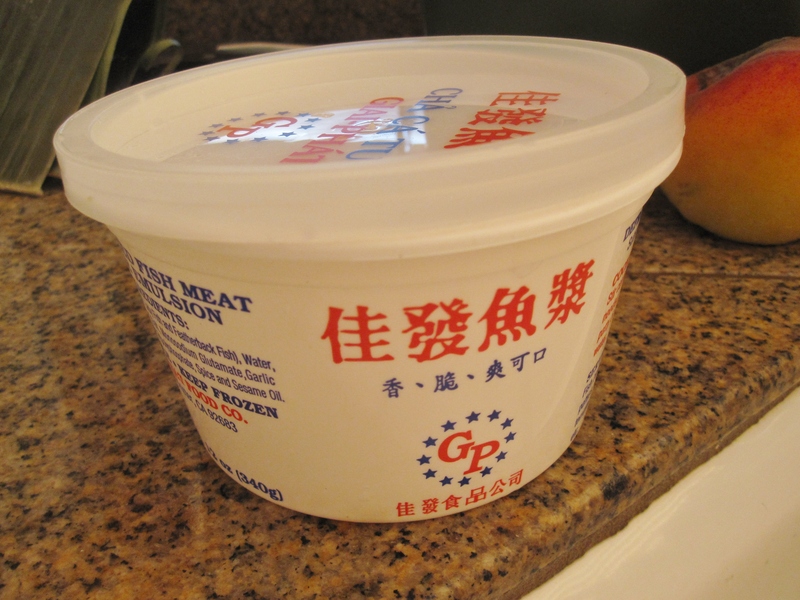 Store in air-tight container for several days before serving. Unlike typical baked goods that calls for freshness, mooncakes are best served several days after baking. This is because when mooncakes “age”, the oil from the fillings and pastry slowly penetrate to the surface, soften the pastry and enhance the flavor even more. Nuts and seeds: I toasted almond and walnuts together in a big tray in the 300° oven for a few minutes, but I toasted sesame seeds and pepitas seeds separately in a dry clean frying pan, stirring constantly over medium low heat until the flavor comes out. Candied winter melon and candied mandarin orange: I find the flavor from candied mandarin orange a little too strong, and amount of candied winter melon is a bit too less. I should increase candied winter melon to 1 cup, and down candied mandarin orange to 2 pieces. I find my mooncake filling is a bit too much to fit into the mooncake mold– next time I should try to make 9 pieces instead. I should also roll out each pastry dough to a very thin layer; this will make wrapping easier and achieve a more even thin layer all around the filling. Oven temperature: while my mooncakes browned nicely on top, the bottom was a little burned. Should I try 350°F for 25 minutes, egg wash then another 5 minutes next time? 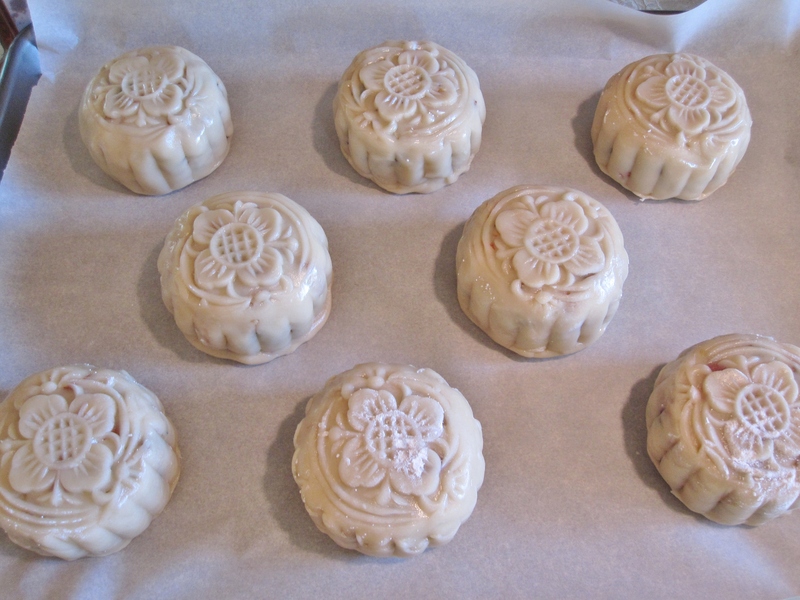 Mixed Nut Mooncakes 伍仁月饼– ready for water spray, then into the oven. I found this recipe while I was searching online for recipes for corn pancakes. 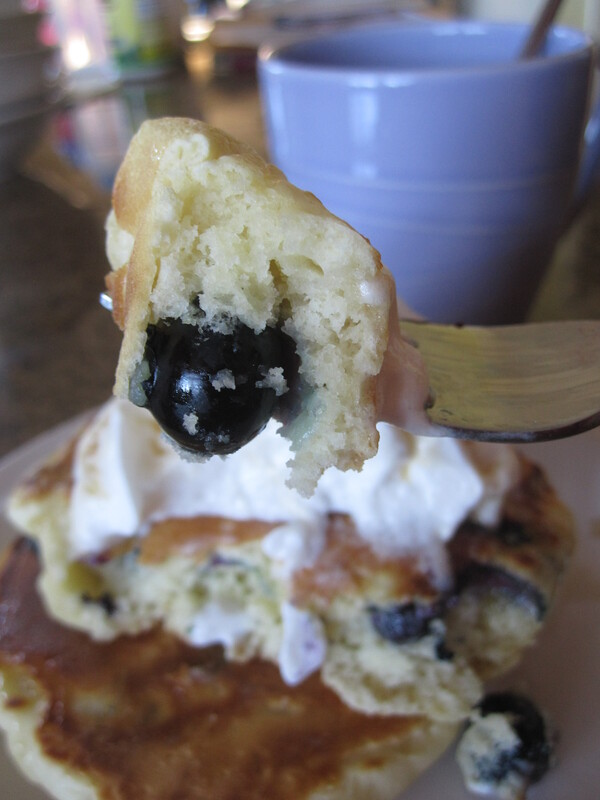 I changed the recipe a bit and also added fresh blueberries. The pancakes turn out quite fluffy too, and the prepping method is a lot easier than my other pancake recipe that calls for egg yolk and egg white separation. Sift flour, sugar, baking powder and salt into a medium bowl. Make a well in the center. Whisk milk, eggs and melted butter, then pour into the dry ingredients all at once. Stir until just combined. The batter will be lumpy. Gently stir in blueberries. Heat a griddle or non-stick pan, then turn down heat to medium low. Pour about 1/3 cup of batter onto the pan, cook until bubbles form. 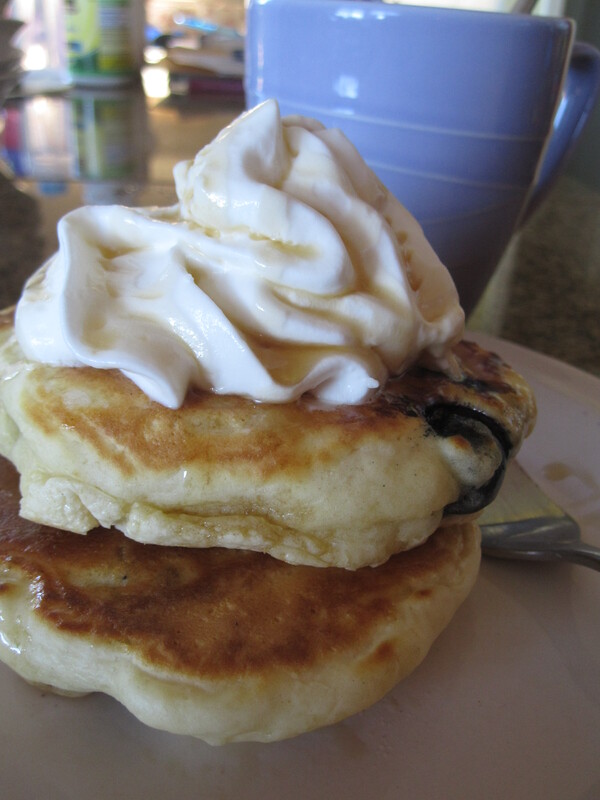 Carefully turn pancakes over and cook the other side until it is lightly brown. DO NOT attempt to press down pancakes while cooking, or pancakes will be dense. Serve immediately with butter, whipped and maple syrup.